Sharon Nyree Williams, has been living in Seattle for thirteen years. In 2006, she founded the collaborative arts organization The Mahogany Project. 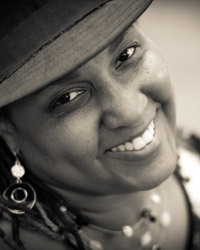 Sharon is an arts administrator, playwright, filmmaker, solo performer, producer and poet. She has written, performed several solo pieces; The American Dream, Homelessness: Driven - Spirited - Broken, Plight: I am my brother's keeper and Circles of Life. Sharon co-produced the short film What About Us, which has been seen in several festivals throughout the United States. In addition, she spent two years as a teaching artist for Freehold Theatre's Engaged Theatre Program for the Washington Correctional Center for Women. Sharon recently celebrated her one-year anniversary as the Managing Director for the Central District Forum for Arts & Ideas. She is really excited about her most recent project--Humanity an album of poetry and music inspired and influenced by her work with the Annual Urban Poverty Forum and a 2011 immersion to Mexico sponsored by Seattle University.